Last summer we had the opportunity to attend our first BLADE show. We had a blast and can’t wait for the upcoming show here in Atlanta. If you live close mark your calendar for this event. 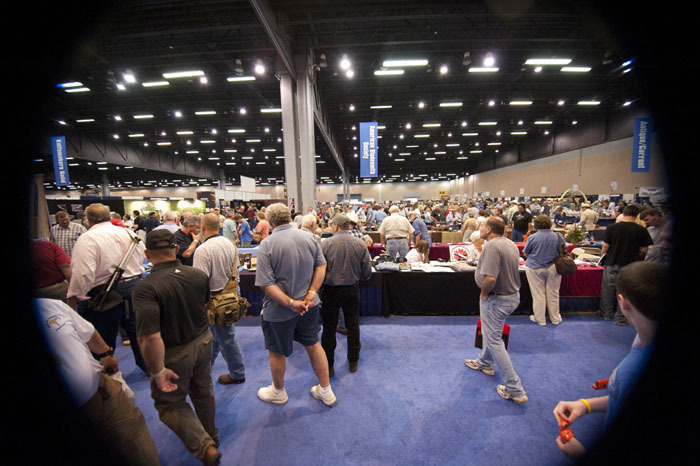 In addition to knives, there is a tactical gear expo that is included in the price of admission. For more information check out the website for the show here. BLADE Magazine is proud to present the world’s LARGEST knife show, featuring the most diverse array of knife manufacturers, custom knifemakers, collections and products under one roof. For 3 days, they will give you the very best of the knife-making and knife-collecting industries–—nearly 700 tables and over 200 factory booths and thousands of products—as well as unique educational seminars and edge-of-seat fun at the BladeSports International Competitions! In addition, check out the Blade Magazine Knife of the Year® awards, Blade Magazine Cutlery Hall of Fame© induction, the annual ABS meeting, the 10th Anniversary BLADE Show World Championship Cutting Competition, forging demos, collecting how-to’s and so much more. Not only is the 2012 Survival+Tactical Gear Expo located under the same roof as the BLADE Show, but entry is FREE with your BLADE Show admission! Survival+Tactical Gear Expo is open to the public and features manufacturers, dealers and suppliers of products and services related to tactical firearms, tactical knives, self-defense gear for civilians and all manner of products for law enforcement and military applications. This entry was posted in Knives, Shooting Events, Tactical Gear and tagged blade show, knife reviews, knife show, tactical gear, tactical gear expo. Bookmark the permalink.